With the vintage look and feel still playing a big role in modern jewellery styles I used these beautiful swarovski beads to create the ultimate in glamour.This 50's inspired 16" necklace is made entirely of swarovski AB graduated beads ranging from 1.5cm to 4mm, and has a sterling silver clasp. AB stands for Aurora Borealis, meaning the beads have been coated which,as you can see, makes the beads shimmer and reflect surrounding colours. To complete the look, this stunning necklace comes with 1" drop earrings, again in the same graduated AB beads.The beads are held onto the sterling silver hook earrings but a swarovski headpin which has a diamante stone at its end for added sparkle. 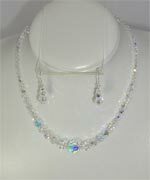 So, if you want to feel like an A list star, or if your getting married and would like a princess necklace for your wedding day why not treat yourself to this set.